Carol Ann Schwartz of Cincinnati is guided by family values. 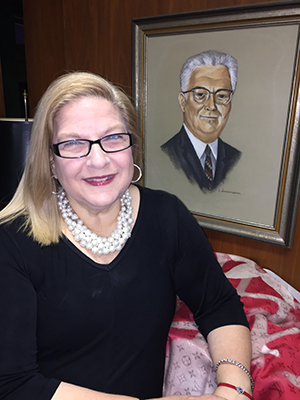 At a very young age, her parents, Shirley and Stanley Gershuny, instilled in her the understanding that “someone else always has less.” They counseled that it was her duty to give back. Their words of wisdom continue to resonate today with Schwartz’s husband, Michael, and their children—Matthew, Allison and Elan. ​After several years in corporate banking, Schwartz joined her father in the family’s commercial real estate investment firm. Around this time, she was also looking to expand her social circle, form new friendships and locate meaningful volunteering opportunities in the Jewish community. Both her mother in Cincinnati and mother-in-law in Detroit were active Hadassah members who knew the benefits of volunteering with the organization. They strongly suggested that Schwartz become involved, and she wholeheartedly agreed. In the Cincinnati Chapter, she found amazing women leaders who trained her to be the charismatic Hadassah vice president she is today. ​The Schwartz family members are strong Zionists who visit Israel every year. When Carol Ann Schwartz chaired the 2016 Hadassah National Convention in Atlanta, her children attended. She said that by seeing Hadassah up close, they got the “big picture” of the organization’s advocacy program, international activities and medical advancements. ​Back home in Ohio, Schwartz helped nurture a relationship between Cincinnati Children’s Hospital Medical Center and Hadassah Medical Organization that allows for Hadassah medical personnel to visit the Midwestern campus. Schwartz grew particularly close to Dr. Polina Stepensky, head of the Department of Bone Marrow Transplantation and Cancer Immunotherapy of Adults and Children at HMO, when the doctor visited Cincinnati. Now, whenever Schwartz is in Israel, she visits Dr. Stepensky and brings gifts for the children at Hadassah’s Charlotte R. Bloomberg Mother and Child Center. ​Carol Ann and Michael Schwartz are Hadassah Founders and generous members of the Society of Major Donors; Carol Ann is a Keeper of the Gate.